Good job… your ecommerce business is ticking along nicely now. Of course, if more people signed up for your new monthly subscription offer the results would be stronger. So that’s where most of your time and effort go these days — working to land new monthly subscribers to grow your business. But recently, an ecommerce colleague you follow on LinkedIn wrote about subscription dunning management and why merchants like you need to use it. Doggone it! Is there no end to the things you need to learn about and put in place for your business? Subscription dunning delivers otherwise lost revenues. When automated in a way that supports your marketing and customer service objectives, it helps retain customers. Subscription dunning processes exemplify modern-day collection tools used around the world. He also discussed something called churn, but by then you’d run out of time; you still want to learn about churn — in case it’s important. Well, it is important to understand churn — and all of the above points are true. 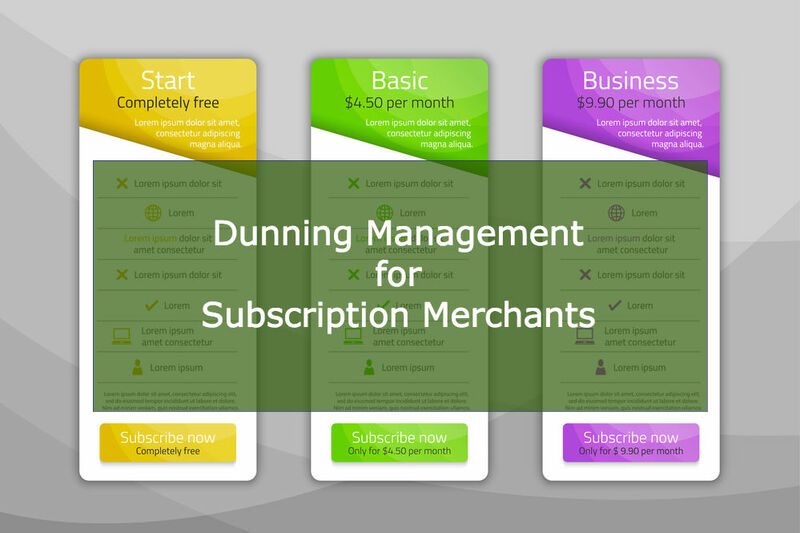 Subscription-based businesses absolutely benefit from good subscription dunning management, but only if merchant owners want to maximize revenues and retain customers. Do you? Then keep reading already so you can check it off the list. Churn — What’s the Big Deal? We all know what it means to churn butter. Elementary school science teachers still let kids shake off excess energy while making butter in a jar half-filled with cream. For ecommerce subscription merchants, churn means losing subscribers and their payments. Ouch. There are two types of churn. Customers who try your service, but then drop it commit voluntary churn. They take action to cancel subscriptions, or choose not to sign up after a free trial period. On the other hand, some customers commit involuntary churn. While it may seem counterintuitive, merchants should utilize subscription dunning to address involuntary churn. That is, if they want to retain good customers to support long-term growth. Doing nothing about churn leaves delinquent payments on the table, and easily leads to substantial lost revenues — something every subscription merchant dreads. Merchants could handle subscription dunning manually via phone calls, letters, or emails to customers whose payments fail, but that’s time consuming and costly — especially as your customer base grows. Which is why merchants implement an automated dunning management process to recapture customers and their payments. Most of the time, it’s relatively easy with simple, friendly follow up dunning messages and a process designed to complement your marketing and customer service plans. Good subscription payment processing (billing) technology automates the subscription dunning process, allowing you to plan and manage an approach that fits your business. To illustrate the value of subscription dunning, let’s look at the example of a meal prep business, Nan Cooks 4U. Nan’s customer base prefers to pre-pay for 3 months of delicious home cooked dinners, delivered twice per week — for which they receive a 10% discount. The average cost is $216 (after discount), and these customers represent 75% of Nan’s 200 loyal customers. Nan faced a high rate of subscription payment failures, in spite of the excellent customer reviews posted on social media. Fifty payments were declined in one month, representing $10,800 in lost revenue. Careful analysis determined the issue occurred as national banks moved credit card portfolios to the EMV standard: Chip cards were issued with new expiration dates. Involuntary churn affected many long-time customer accounts because cardholders forgot to update their account information. Send automated email reminder three days before upcoming subscription payments, asking customers to verify or update their account payment details. If payment declines occur, send an automatic decline notice and ask customer to update information. At the same time, tell them the payment will be retried every five days — and the subscription will stay current for one month at no extra charge. Retry declined payments according to communicated schedule. Requested Account Updater assistance from her merchant account holder to receive automatic updates to customers’ payment card details, going forward. With each communication, Nan thanks customers for their business and asks for feedback on the meals offered — and her delivery service. Every six months, she offers “good customer rewards” like free desserts for loyal customers who remain in good standing. What was the result of Nan’s proactive subscription dunning efforts? Happily, Nan recaptured 80% of the 50 subscription payments that bounced. So far, her subscription dunning efforts — along with the super-delicious meals she delivers — have helped Nan retain customers and expand her business to new, larger kitchens. The right type of merchant account that handles recurring billing — and the right processing partner — can ensure payments from subscribers process quickly and effectively to maximize revenues. We’re the leading provider of merchant accounts and payment technology to subscription companies. But MerchACT is more than a processor. We serve as a consultant and a payments adviser to help your business succeed — including subscription dunning advisory services custom tailored to fit your needs. When you’re ready to work with a payments processor focused on helping your business grow — while you deliver subscription products or services — give MerchACT a call. We’d like to be your partner.